Project No Winter Alligator Skin is now in full effect. The radiator heat is blasting in my apartment as we speak (and it's not even that cold - rude), and I can feel my skin beginning to get drier. I recently have been using these two body products and have been loving the results. I think they are going to be just what I need to carry me into the winter season. 1. Kate Somerville Exfolikate Body - The regular Exfolikate for the face is such an intense exfoliating treatment that I was curious as to how it would translate to a body scrub. Thankfully, it takes all the elements that make Exfolikate so great, adds a bit of a creamy texture for a gorgeous exfoliating experience. The texture is granular but not as dense as Exfolikate for the face, and a little bit can go a long way. I apply this all over my body while in the shower, and then wait a minute or two so the steam can activate the enzymes and then rinse off. For me, it gives the perfect balance of a gentle yet thorough exfoliation. And the added enzyme exfoliation aids in ensuring my skin stays softer for longer than a standard body scrub. And the fact that there is no annoying oily residue left in my tub that I can slip after makes this even more of a "love" product for me. 2. 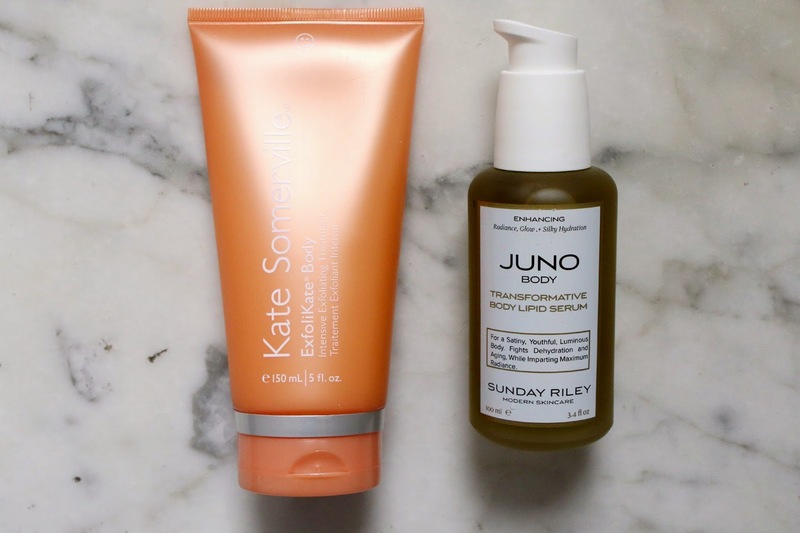 Sunday Riley Juno Body Transformative Body Lipid Serum - I'm quite the fan of beauty oils - cleansing oils, face oils and body oils are all staples in my routine. However, I had heard this Juno Serum was a bit different in the way that it helps with not only hydration, but with the tone and elasticity of the skin. I've been using for a few weeks now and while the results are ever so slight, I have noticed a difference. Typically with many of my body oils, they simply feel great and keep my skin soft and smooth. While the Juno Serum does all of those things, I have noticed my skin seems more toned and taut as well which was a pleasant surprise. Another added bonus is I can get dressed quicker than my other body creams and oils because this Juno Serum soaks in amazingly fast. And in the morning, those few minutes can really make a difference! Firmer skin and a few minutes extra sleep - sold!